Lone Survivor is a movie about the 2005 Afghanistan mission, Operation Red Wings, in which a four-man team of Navy SEALs was tasked with scouting out Ahmad Shah—a terrorist leader aligned with the Taliban and other militant groups close to the Pakistani border. The SEALs were compromised when local goat herders stumbled over them, and they were ambushed shortly thereafter. Three of the SEALs were eventually killed, along with sixteen more special operations operatives who were coming to their rescue. Marcus Luttrell was the only survivor, and the movie is based on his book about the mission. The four SEALs were played by Mark Wahlberg (Hospital Corpsman 2nd Class Marcus Luttrell), Taylor Kitsch (Lt. Michael Murphy), Emile Hirsch (Gunner’s Mate 2nd Class Danny Deitz), and Ben Foster (Sonar Technician 2nd Class Matthew Axelson). The movie was written by Peter Berg, Marcus Luttrell, and Patrick Robinson, and directed by Peter Berg. The acting and production are excellent, and by all reports from veterans, the look, feel, spirit, and heart of the movie are accurate right down to the varying sounds of the rifles and the brass. Only a short portion of the movie is purely contrived to satisfy the demands of storytelling structure, but it is irrelevant to the main story of these extraordinary men, and it does not detract from the cinematic experience of this very real event in Afghanistan in the Global War on Terror. In my opinion, minors or those who have a low tolerance for vivid combat scenes should not see Lone Survivor. The movie is very detailed in its violence. However, in this case, we cannot call that violence gratuitous because it really happened. Excluding it would have made the movie a pure fantasy. The production values were high. Even the fast-moving combat scenes were filmed with attention to detail. The film crew, lighting crew, and sound editing crew earned their paychecks. My one technical criticism would be that the music is overdone at times for my taste. When fighting the Taliban in the mountains, there was no music to help shape the emotions and responses of the four Navy SEALS involved in the main mission. I suppose that when moviegoers pay $13.00 to see a war movie, the folks in Hollywood know that nobody will leave satisfied if they get a “realistic” piece of war without some emotional music thrown in. The acting and directing are excellent. 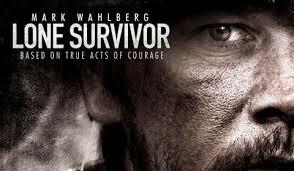 I have the impression that the entire crew worked hard to produce Lone Survivor. I am glad that they did. The men that the story is about deserved that. The movie gives a brief view of the dull routine of living in the noisy, tedious reality of life for troops in a plywood-and-canvas base in Afghanistan, followed by the hell that awaits them when they step out of that life in Plywoodville. The troops don’t complain about Plywoodville. It’s a serious upgrade from the unsanitary conditions in Dustville, that town outside their base. Since Lone Survivor is a (mostly) true story about real people experiencing a real hell, giving them a warmer and more cheerful “normal” day would have been dishonest. It is best that we see their reality for what it is. However, the obvious, very real, billion-dollar-a-week questions are not even hinted at in this movie. Why did these men lack airborne communications support? Why were they fighting with so little available back up? What the hell is going on when we send men on such dangerous deep missions with so little resources? And where the hell are all those billions going in Afghanistan? Lone Survivor is clearly not intended to touch on those vital public policy issues, but the movie does do a good job of hinting at what those four Navy SEALs went through in that brief portion of their service to the United States of America. For that slice of reality, I am grateful. From left to right, Sonar Technician (Surface) 2nd Class Matthew G. Axelson, of Cupertino, Calif; Senior Chief Information Systems Technician Daniel R. Healy, of Exeter, N.H.; Quartermaster 2nd Class James Suh, of Deerfield Beach, Fla.; Hospital Corpsman 2nd Class Marcus Luttrell; Machinist’s Mate 2nd Class Eric S. Patton, of Boulder City, Nev.; and Lt. Michael P. Murphy, of Patchogue, N.Y. With the exception of Luttrell, all were killed June 28, 2005, by enemy forces while supporting Operation Red Wings. For those that want a glance at the war in Afghanistan from a warrior’s point of view, this movie deserves a .44 Magnum rating—our highest. It is fully worth the $13.00. For those who don’t wish to glance at that dark reality of operations in Afghanistan, stay home and watch the usual half-assed reporting about it on television. I LOVE this review!! I want to hug it and shower it with kisses, especially the last paragraph. The American public forgets we are at war. They do. Very different from when I was young, and everyone was touched by VietNam. Awesome review, Piper. There are some brave people out there. This was–appropriately–mostly Holmes, Catherine. Thank you for your appreciation. There indeed are some amazing people. Thanks for this review! I saw a trailer for it and wasn’t sure until now. This is going on our must-see list. War stories are not easy to watch, but they should remind us to be grateful to those who serve our country. Sounds like this one does. I think it does. Please let us know what you think.